Like most other NAS manufacturers, Thecus has a common operating system for its NASes. The current operating system is ThecusOS 7. You can download the complete 160 page OS7 User's manual or use the live demo (username: admin / password: thecus). The screenshot below shows the N2350 desktop. The control panel allows you to configure the N2350. Like most other NASes, Thecus provides a library of installable applications. Of course, not all applications will run on entry-level NASes due to CPU limitations. Firmware version 3.02.02.1.a385 (Thecus OS7) was loaded onto the N2350 and performance tests were run using the Revision 5 NAS test process. All tests were run using Western Digital Red 1 TB WD10EFRX drives we provided. While the N2350 supports both the EXT4 and the XFS filesystems, all tests were run using EXT 4 formatted volumes. With the exception of the RAID 0 File Copy Read test, all of the File Copy Read and Write tests for the N2350, as well as the ZyXEL NAS 326, were in excess of 100 MB/s. In general, the N2350 and the NAS326 turned in similar results for many tests, which were both often higher than the QNAP TS-228's results. 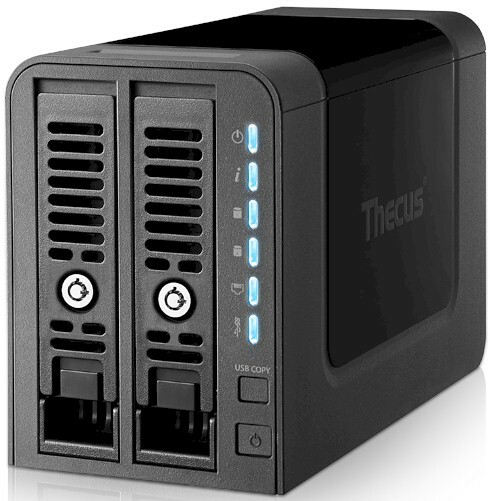 The Thecus N2350 doesn't have USB 2.0 or eSATA ports, so only USB 3.0 backup tests were run. The TS-228 outperformed both the N2350 and the NAS326 by significant margins. It was about twice as fast as the N2350 and four times as fast as the NAS326. However, the Thecus N2350 took bragging rights for network backup (68.7 MB/s) compared to the TS-228 (26.0 MB/s) and ZyXEL NAS326 (28.4 MB/s). The N2350 and the NAS326 turned in similar results for iSCSI. The TS-228 doesn't support iSCSI. The subcategory rankings show the N2350 scored fairly well compared with the other two NASes. It had category wins for Write Benchmarks, Mixed Read Write and for Backup. The N2350's weakest performance was for Read Benchmarks, where it ranked #8 behind the other two NASes that tied for #6. It also lagged just slightly behind the NAS326 for Video benchmarks but outperformed the TS-228 for the category. For iSCSI benchmarks, the N2350 and the NAS326 tied for category rank at #6. The Thecus N2350 has a few features not typically found on entry-level NASes—hot swappable drives and iSCSI support. Even better, it supports iSCSI initiator, a feature lacking even in many much more expensive NASes. With iSCSI initiator, you can use other NASes running as iSCSI targets to create a very large storage pool on the N2350. Most home users are unlikely to use iSCSI at all. But in a small office environment, the N2350's iSCSI features could be put to good use. The N2350 scored just slightly better than the ZyXEL NAS326 in many tests. Both the benchmark summary and the NAS Ranker showed both products had very similar performance, with the exception of the Backup category where the NAS326 fell short of the other two NASes. However, the ZyXEL NAS326 is currently $50 cheaper than the N2350, leaving you with more money to buy drives. On the other hand, ZyXEL's NAS OS isn't as fully-featured as Thecus', nor does it have as many installable apps. There isn't a clear cut choice; you'll need to choose based on what matters most to you. However, given the better performance of the N2350 and the ZyXEL NAS326, you wouldn't really choose the QNAP TS-228 at the higher price—especially without iSCSI support or hot swappable drives—unless you just plain prefer QNAP's OS. If you're going to spend $130 or more, you'd be better off stepping up to one of the higher-ranked NASes like the #4 ranked Synology DS216j. Of course, choosing on the basis of price can depend on when you're reading this review.When talking about value, obviously price is an important consideration. Amazon's, uh, dynamic pricing makes shopping by price much more difficult and frequently makes the pricing in our Charts, Rankers and Finders appear to be misleading. For example, I read through some previous reviews to see how pricing compared as of the date of the reviews. Here's a table that shows the pricing of the two NASes used for comparison in this review as well as the higher ranked Synology DS216j that I reviewed in January. From the Total NAS Ranker chart above, the DS216j is ranked #4, and, if you use the Ranker to look at category performance, you'll see that it has significantly better Read Benchmark and Write Benchmark category scores. When reviewed, at $119, the DS216j was a real steal and a no-brainer decision. Now, at priced at $170, the value proposition isn't so clear cut. Our Amazon pricing is updated every night directly from Amazon data feeds, taking the lowest price Amazon reports. However, we're seeing more often this "lowest" price isn't really the best deal. It may ship from a little third-party seller located outside the U.S and not include shipping and import fees. Sometimes, it even reflects used or refurbished product pricing. The bottom line is that if you're interested in a product, always click over to Amazon to check latest pricing.